Jottings Press is a unique collection of personal histories, poetry & art collections, and children’s stories – jottings for inquisitive minds of all ages. 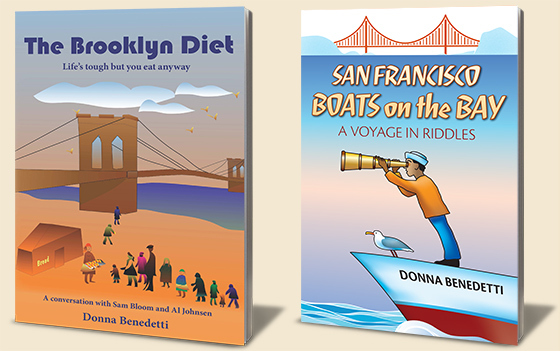 Written by Donna Benedetti and designed by Jeremy Thornton, San Francisco Boats on the Bay provides an accessible, playful way for children to learn about 24 distinct vessels that crisscross San Francisco Bay. Boats include kayaks, tugboats, ferries, barges, sailboats, oil tankers and many others. SF Boats on the Bay is packed with entertaining boat stories, astounding facts, and heroic crews that will captivate children and adults alike. This is a book that will inevitably engage its readers as critical thinkers who ask questions – whether it's about the name of a boat, what it does, where it goes or what its history is – and try to answer those questions.